Some 100 Southeast Asian and Qatari companies are expected to take part in a trade and investment seminar in Doha in November, which forms part of Asean’s 50th founding anniversary celebration. Speaking to reporters yesterday, Asean Committee in Doha (ACD) chairman and Thailand ambassador Soonthorn Chaiyindeepum said the seminar aims to promote Asean as an attractive market of 622mn people with a combined GDP of $2.6tn. The envoy noted that this event is being organised by ACD to heed to the Qatari government’s call of diversification efforts in export and trade. “Not only that, but we are also looking for long term investment as well,” Chaiyindeepum stressed. ACD hopes to attract Asean (Thailand, Singapore, Philippines, Malaysia, Indonesia, Vietnam, Myanmar, Cambodia, Laos, and Brunei) companies operating not only in South East Asia but also in Qatar and the Gulf region, as well as Qatari companies for the seminar. 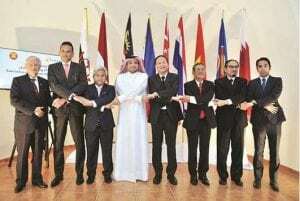 It will be held by the end of November after the 31st Asean Summit in the Philippines. ACD organised a similar seminar with Qatar Chamber last year and Chaiyindeepum said: “we want to build up from that momentum,” which he described as a good opportunity for the bloc to make its presence in Qatar. “We all have a lot of products to offer especially for Thailand because we have been exporting food and manufacturing products such as construction materials, which is also highly in demand in Qatar,” he pointed out, adding that the seminar will be one of the main highlights of the Asean activities in the country. Singapore ambassador Jai Sohan Singh echoed this statement saying that such diversification efforts fit well between Qatar and Asean. He said the seminar will not only give Asean (as a bloc) a profile in the country but also sends a positive message that it is very much willing to contribute to Qatar in achieving its National Vision 2030. He noted that exporting halal food to a Muslim country such as Qatar is a big opportunity, which Singapore is looking at especially for the long term.